4 Things To Know About What's Happening In Ukraine : Parallels The big question is about the country's future: Will the former Soviet republic move closer to the EU or remain in Russia's orbit? 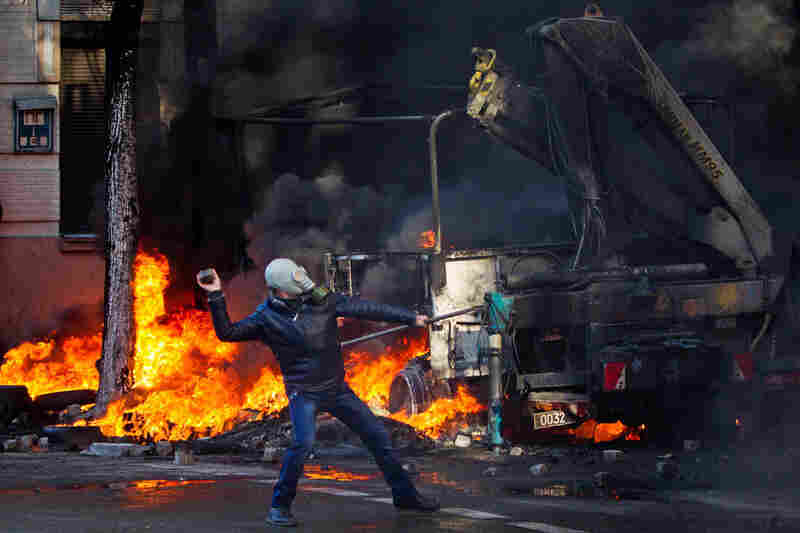 An anti-government protester throws a stone during clashes with riot police Wednesday in Kiev. 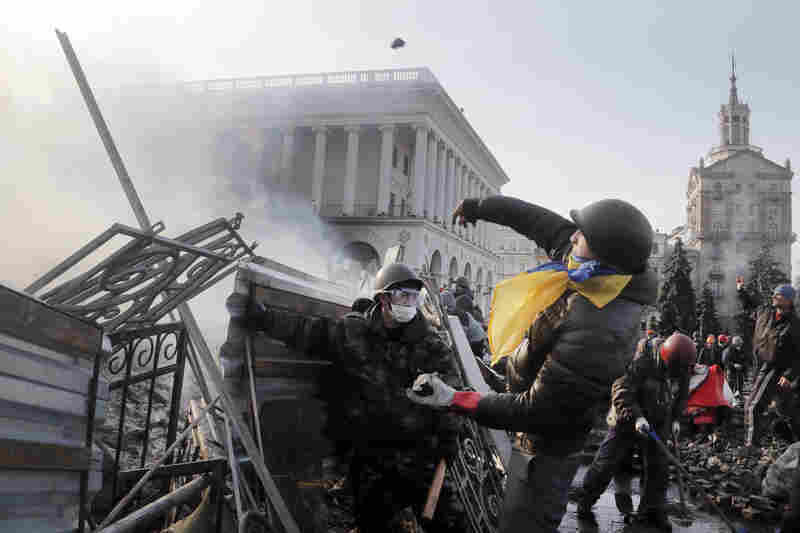 Streets and squares in Ukraine's capital are littered with rocks, bricks, spent stun grenades and tear gas canisters, rubber bullets and burning tires, the BBC's David Stern said on Morning Edition. Armed with a large slingshot, anti-government demonstrators fire objects toward Interior Ministry members and riot police in Kiev. Police in Kiev attacked an opposition camp at the center of the massive anti-government protests that began in November. 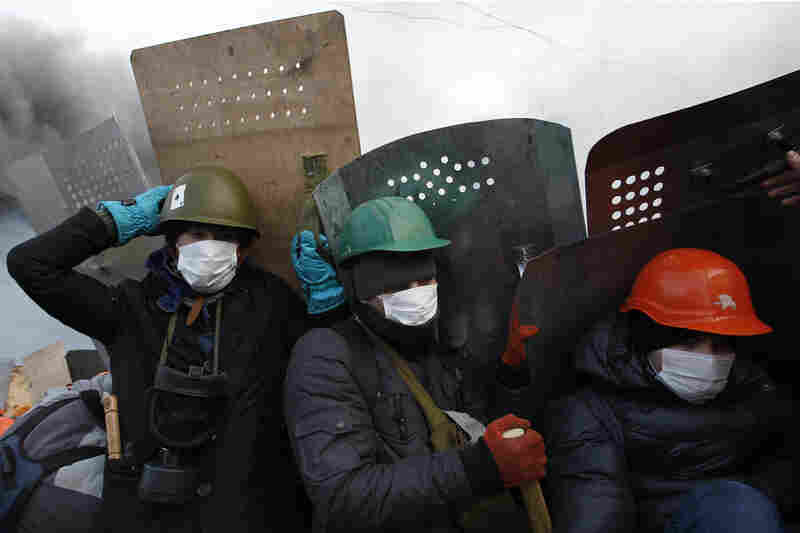 Anti-government demonstrators take cover behind shields as they gather in Independence Square in Kiev. 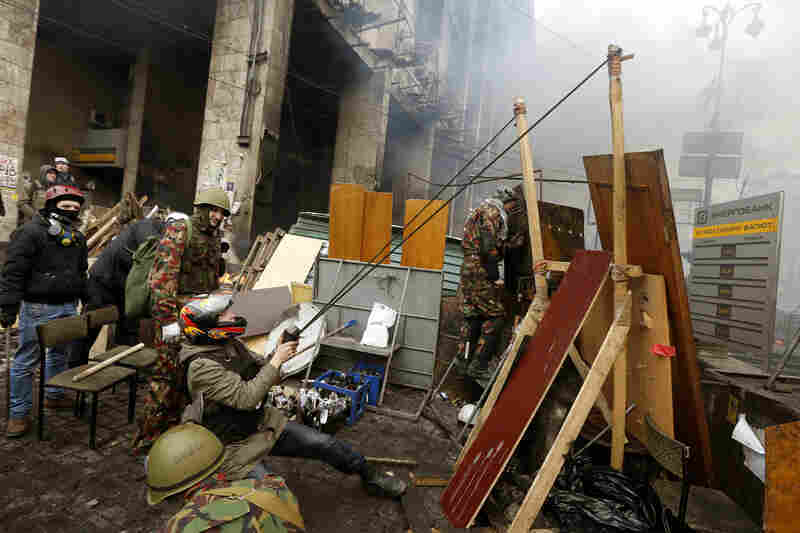 At least 25 people were killed Tuesday and another 241 were injured, according to The Associated Press. Ukrainian riot police take cover behind their shields during clashes with anti-government protesters near Independence Square on Tuesday. Late last year, President Viktor Yanukovych rejected a trade deal with the European Union in favor of closer ties with Moscow, leading to protests against his government. Anti-government protesters guard the perimeter of Independence Square, known as Maidan in Kiev. 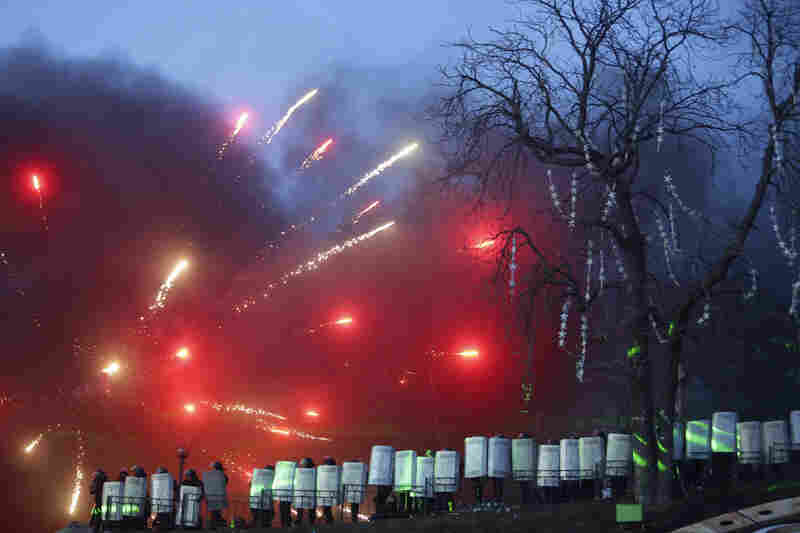 Police dismantled some of the barricades, but, the AP noted, "the 20,000 demonstrators fought back, armed with rocks, bats and firebombs, and singing the Ukrainian national anthem." 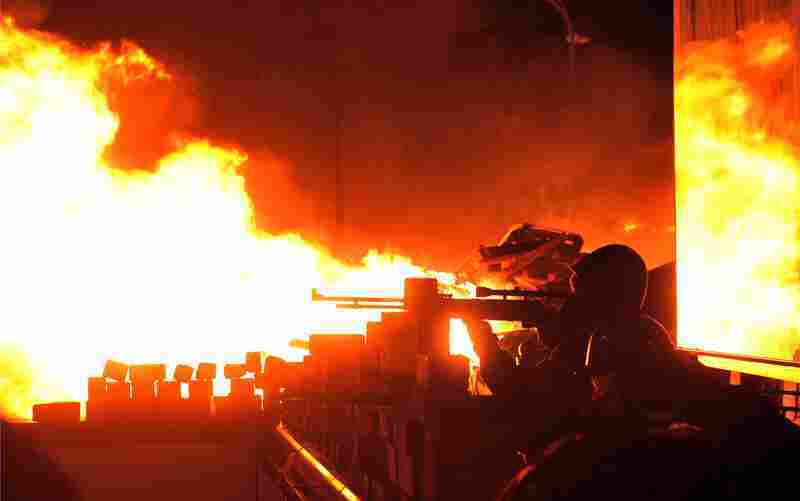 Flames engulf the main anti-government protest camp as riot police try to force demonstrators out. "The situation seems to be escalating even further, which is probably what most people are worried about most of all because it doesn't seem it will ever end," reporter David Stern says, "and there is a question of what will happen to Ukraine as a whole if this does spread ... beyond the capital." A demonstrator throws rocks during violent clashes between opposition protesters and riot police in Kiev. 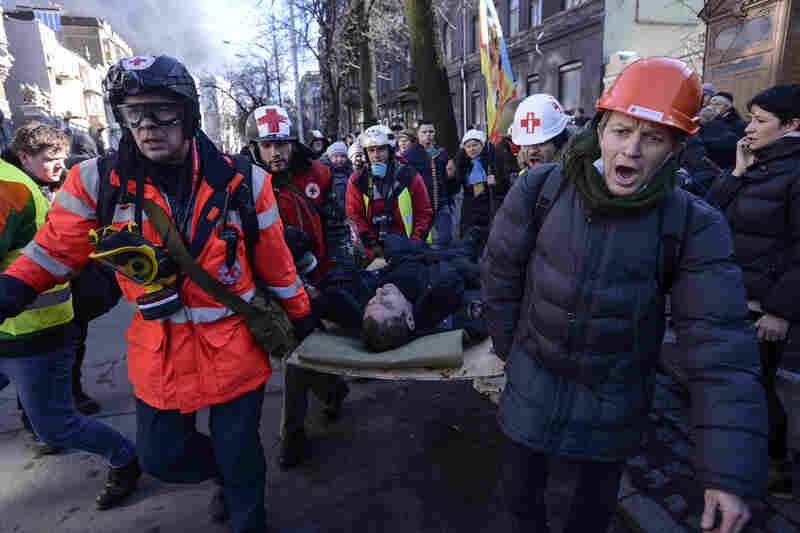 An Interior Ministry member, who was injured during clashes with anti-government protesters, is transported on a stretcher in Kiev. This post has been updated to reflect Friday's agreement reached between the government and the opposition. Ukrainian President Viktor Yanukovych and leaders of the anti-government opposition reached an agreement on a deal to hold new elections, form a unity government and restore a constitution drafted in 2004. The deal could lead to an end to the violence that has killed more than 70 people since it erupted earlier this week. Here's a short primer on the events and the major players involved in the current confrontation. Last November, Yanukovych was expected to sign a landmark agreement with the European Union that would have resulted in a free trade deal between them, as well as closer political relations. The association agreement, as the deal was officially called, would have pushed the former Soviet republic away from Russia, its No. 1 trading partner, and toward the West. But Russia was troubled by the prospect of its loss of influence and threatened trade sanctions against Ukraine. That's when Yanukovych walked away from the deal with the EU. His government said Europe did not offer compensation for the loss of trade with Russia. Ukrainians who had wanted closer ties with Europe began protesting in Kiev's Independence Square. Police raided the event and arrested more than 30 people, spurring even larger demonstrations that brought 100,000 people to Kiev. There's been sporadic violence since the protests began, but none as serious as the clashes Tuesday. Since then, more than 70 people have been killed and hundreds wounded in the fighting between protesters and police. 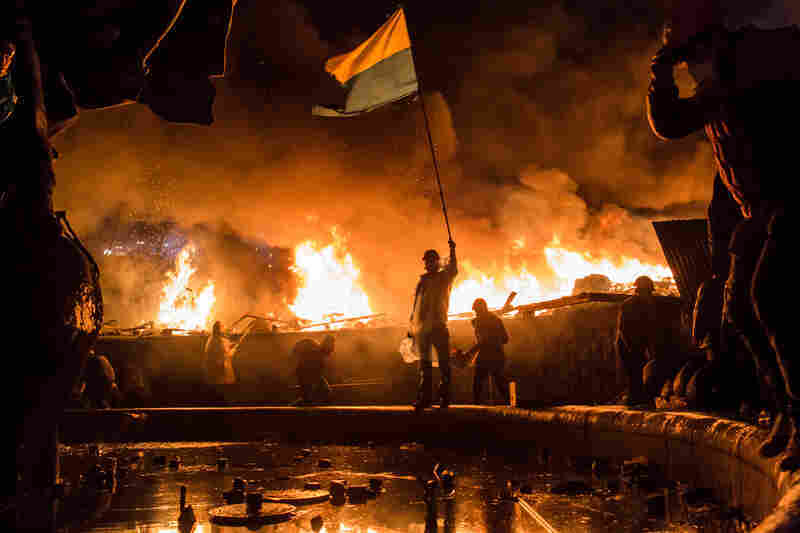 "The latest bout of street violence began Tuesday when protesters attacked police lines and set fires outside Parliament, accusing Yanukovych of ignoring their demands to enact constitutional reforms that would limit the president's power — a key opposition demand. Parliament, dominated by his supporters, was stalling on taking up a constitutional reform to limit presidential powers. "Police responded by attacking the protest camp. Armed with water cannons, stun grenades and rubber bullets, police dismantled some barricades and took part of the Maidan. But the protesters held their ground through the night, encircling the camp with new burning barricades of tires, furniture and debris." There was news of a "truce" between the parties on Wednesday, but barely after it was declared, there was more massive violence. The White House said it was "outraged by the images of Ukrainian security forces firing automatic weapons on their own people." Then there's the economy: Ukraine is struggling to recover from a recession, and the current unrest has resulted in capital flight, a currency in free fall and diminishing foreign exchange reserves. All of these factors are contributing to the political instability, which in turn is making the economy worse. Yanukovych: To understand where the Ukrainian president stands and why there's so much animosity directed at him, we need to go back to 2004. That's when Yanukovych first won the presidential election. But his opponents said those elections were deeply flawed and held daily protests until he was ousted. Those events were dubbed the Orange Revolution. But Ukraine's problems were not solved. Ukraine's new leaders, who were seen as Western-leaning, also became deeply unpopular, and when elections were held in 2010, Yanukovych won. Protesters: We've told you about some of the more prominent opposition leaders, such as Vitali Klitschko, the former boxing champion. Then there's Arseniy Yatsenyuk, whom the U.S. apparently backs, according to a leaked phone conversation; and Oleh Tyahnybok of the far-right Svoboda. All three men signed Friday's agreement with Yanukovych. There's also Yulia Tymoshenko, the former prime minister who lost the presidential race to Yanukovych in 2010. She was in prison on what critics say are trumped up charges, but was released after a parliamentary vote on Saturday. But the anti-government protesters are a disparate lot, ranging from democrats who want closer ties to the West, to civil society organizations, as well as extreme right-wing groups. As the Economist noted, less than one-third belong to any organization. And, as the Associated Press reports, "protesters booed opposition figures who took to a stage Friday to present the deal." Their main demand, Yanukovych's immediate departure, hasn't been met. Russia: The two countries share close historic and cultural ties, but there are also economic reasons behind Moscow's desire to retain influence over Kiev. Russia wanted Ukraine to join a Moscow-led customs union, together with some other former Soviet states. Just how badly does Russia want to keep Ukraine in its sphere of influence? In 2008, when Kiev was considering joining NATO, President Vladimir Putin threatened to aim Russia's nuclear missiles at Ukraine. Two years later, Yanukovych said he was abandoning the country's bid to join the alliance. Putin has steadfastly supported Yanukovych during the protests, and his Foreign Ministry called the violence a "connivance by Western politicians and European structures." After Yanukovych walked away from the EU deal, Putin said Russia would buy $15 billion worth of Ukrainian bonds, giving the country a much-needed financial lifeline. Moscow made an initial bond purchase of $3 billion, put the payments on hold amid the violence, and then resumed them again this week. On Friday, Russia said it would take a wait-and-see approach on the rest of the money. A Russian mediator in Ukraine refused to sign the deal, but the country's Foreign Ministry said that didn't mean Moscow wasn't interested in compromise. West: EU foreign ministers held an emergency meeting in Brussels Thursday where they agreed to move ahead with sanctions, including visa bans on those responsible for the violence, and a freeze on their assets. The foreign ministers of France, Germany and Poland brokered Friday's agreement after meeting with both sides. And the German and French ministers witnessed the deal being signed. The U.S. put visa travel bans on 20 Ukrainians Wednesday. And on Friday, the White House said the deal was consistent with what the U.S. was advocating.